China-based Huawei overtook Apple to claim the No. 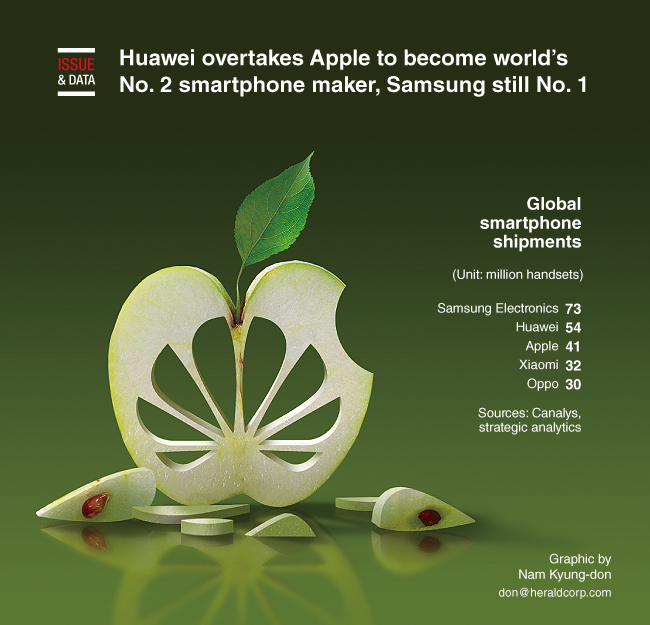 2 spot in the global smartphone market in the second quarter of the year, according to International Data Corp.
South Korean consumer electronics titan Samsung remained the top smartphone maker, shipping 73 million handsets, according to IDC's Worldwide Quarterly Mobile Phone Tracker. Huawei rose to second place with shipments of 54 million units. Silicon Valley-based Apple shipped 41 million iPhones, claiming 12.1 percent of the global market compared to 20.9 percent for Samsung and 15.8 percent for Huawei. It was the first time since early 2010 that Apple was not in one of the top two spots in the smartphone market, according to IDC.